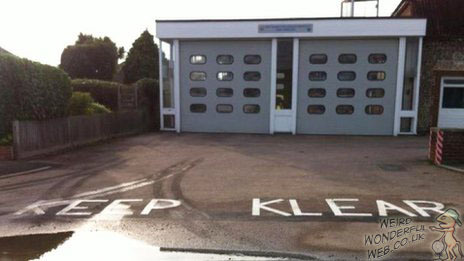 The new markings outside East Preston fire station had to be corrected later. Looks like the 'word on the street' is wrong! These fresh new road markings outside East Preston fire station in West Sussex, England were later corrected after the West Sussex Fire and Rescue service were alerted to the error via Facebook. A spokeswoman for Southern Gas Networks said "This serves as a reminder to all our staff to double-check their work". So remember kids - CLEAR is spelt with a 'Curly kuh' and not with a 'Kicking kuh'.